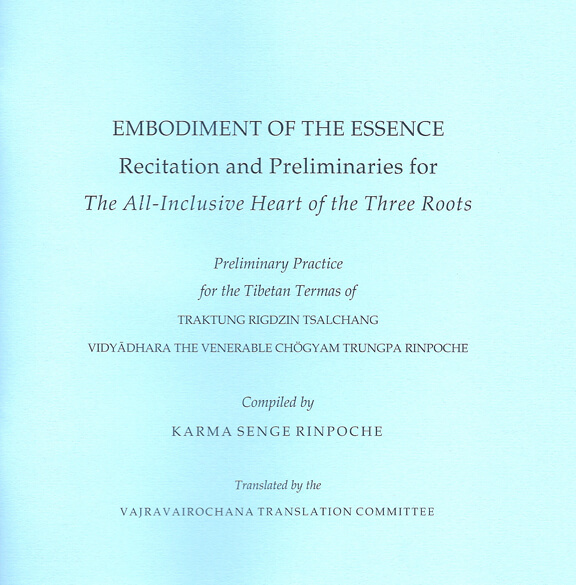 The Translation Committee is pleased to announce the publication of Embodiment of the Essence: Recitation and Preliminaries for The All-­Inclusive Heart of the Three Roots. 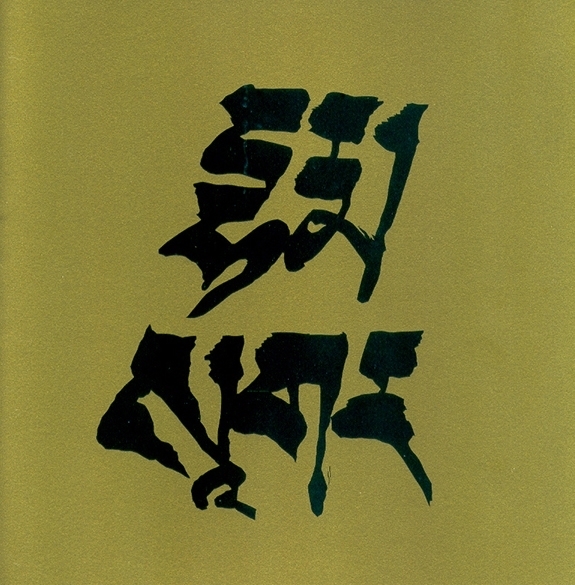 This text compiled by Karma Senge Rinpoche, together with its practice manual, is used for practicing the preliminaries, or ngöndro, for the termas that the Vidyadhara discovered in Tibet during his youth. It is available to anyone who has received the abhisheka or lung for the Avalokiteshvara sadhana, The Sadhana of Nonmeditation. 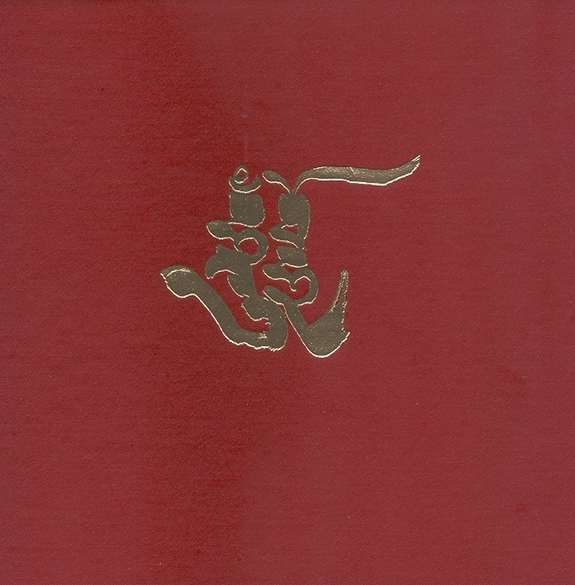 Most of the chanted portions of the liturgy come from the Vidyadhara’s Collected Tibetan Works. Seventeen texts are included, used either in their entirety or in excerpt. Although these liturgies have a distinctive ati flavor, Karma Senge Rinpoche has explained that this is a mahamudra practice based on devotion. 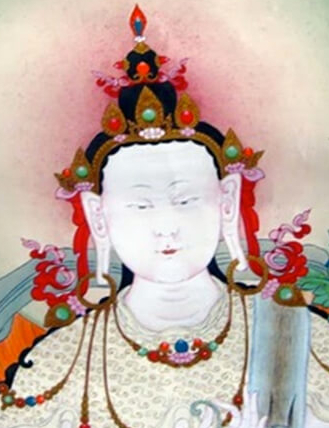 Through practicing it, we can make a deeper connection with the Vidyadhara’s teachings in general and, in particular, with the termas that he discovered in Tibet. It was during his last visit to Halifax in 2007 that Karma Senge Rinpoche first discussed the need for such a ngöndro. He explained that, just as other important terma cycles often have their own ngöndro, the Vidyadhara’s termas also require one. 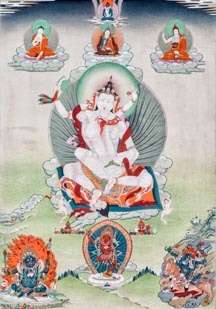 The Vidyadhara, whose tertön name is Traktung Rigdzin Tsalchang (“Heruka Vidyadhara Power Wielder”), discovered three major terma cycles in Tibet. During our first visit to China in 2011, Karma Senge Rinpoche began compiling a ngöndro liturgy and writing a commentary to it. 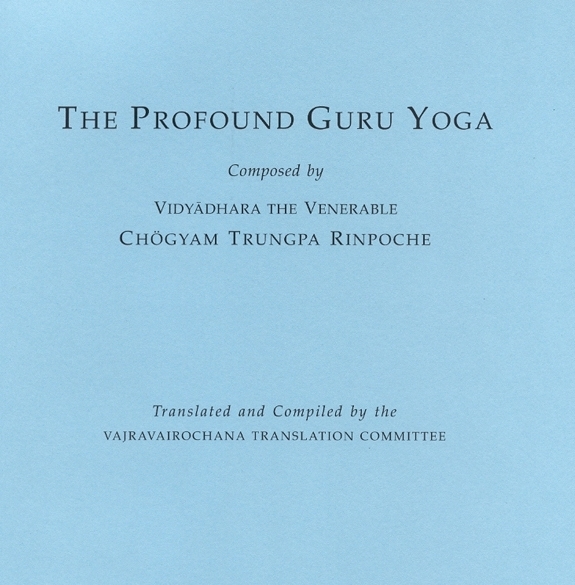 The practice was based on how the Vidyadhara himself had taught ngöndro to his students in Tibet. One day, after a pilgrimage to Emei Shan, one of China’s four sacred Buddhist mountains, Rinpoche was especially inspired to work on the ngöndro. He explained to us that his commentary arose in his mind due to the blessings of the guru. During our return visits in 2013 and 2015, Rinpoche made further (often considerable) changes and clarifications to the practice. This ngöndro includes general and special preliminaries. The general preliminaries are comprised of contemplating the four reminders, taking refuge, and arousing bodhichitta. The special preliminaries include Vajrasattva practice and guru yoga, the latter of which is further divided into prostrations, sevenfold service, mandala offering, supplicating the guru, and reciting the Vajra Guru mantra. Practitioners who have already completed one full ngöndro may practice it in an abbreviated fashion. Finishing this project—first begun in 2007—has been a long process for the Committee, but certainly worth all the effort. It has been exciting for us to participate in creating an important new context for studying and practicing the Vidyadhara’s termas.